Heriot’s consolidated their position in the top four of the BT Premiership with a hard won victory over Hawick at Mansfield Park with a performance that showed the Goldenacre men can cope with foul-weather conditions. A blustery wind and heavy rain reduced the game to one of limited rugby but in the event Heriot’s coped better, moving the ball when they could and defending skilfully. For their part Hawick were dominant in the set scrum but the Greens were unable to convert that power into points as a result of inaccurate passing and their propensity to turn over ball in their opponents’ 22m area. Heriot’s after establishing an early lead with a Graham Wilson penalty goal struck decisively after opting to move the ball wide. Stand-off Gregor McNeish’s did the damage with a long pass to John Rae to put the wing on course for the line. Rae was stopped by Mike Allen but in the follow-up, Max Learmonth swept through to score the only try of the match. Hawick should have hit back after pressure on the Heriot’s line but the Greens were unable to exert control. 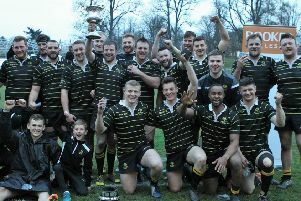 Then in a second half of deteriorating overhead conditions, Wilson kicked a second penalty but Hawick’s attempts to counter came to nought leaving the defending champions to celebrate their win.